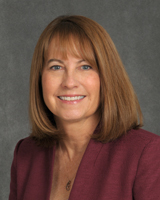 As the Program Director for the Registered Nurse to Baccalaureate and Registered Nurse Baccalaureate to Master’s programs, Dr. Gambino is currently involved in the development of curriculum and clinical opportunities aimed at meeting the unique needs of associate to baccalaureate nursing students. She is the faculty liaison for the Suffolk County Community College/Stony Brook University Nursing First Initiative and has assisted in the development of academic partnership programs with area health care institutions. These alliances promote education, enhance professional growth, and provide employment opportunities for RN students. Dr. Gambino has been instrumental in the establishment of a team-based learning platform for on-site and distance-learning nursing education. She is also involved in designing interprofessional simulation experiences for RN, medical, and social work students. Dr. Gambino is a member of the Stony Brook University’s Institutional Review Board. She serves as a manuscript reviewer for the Journal of Advanced Nursing and Worldviews on Evidence-Based Nursing. Research and Academic Interests: Curriculum development, incivility in nursing education, and the transition and retention of new graduate nurses to professional practice. Registered Nurse Motivation for Entry, Occupational Commitment, and Intent to Stay in Current Position, with Present Employer, and in the Nursing Profession, dissertation research, 2009. Gambino, K.M. (2010). Motivation for entry, occupational commitment and intent to remain: A survey regarding Registered Nurse retention. Journal of Advanced Nursing, 66, 2532 – 2541.
International Business and Economy Conference (IBEC), 1/7/10 – 1/10/10, University of  Management and Economics, Prague, Czech Republic (Podium presentation, Motivation for Entry, Occupational Commitment and an Intent to Remain:  A Survey Regarding Registered Nurse Retention). American Association of Colleges of Nursing Faculty Development Conference, St. Petersburg, FL, 2/4 - 2/5/16 (Poster presentation, Using an Innovative Academic Practice Partnership to Enhance Clinical Experiences and Employability of Registered Nurse Baccalaureate Students: A Perioperative Immersion Program). American Association of Colleges of Nursing Faculty Development Conference, St. Petersburg, FL, 2/4 - 2/5/16 (Poster presentation, Supporting Registered Nurse to Baccalaureate Students as BSN in 10 Becomes a Reality). American Association of Colleges of Nursing National Baccalaureate Education Conference, Baltimore, MD, 11/20 - 11/22/14 (Poster presentation Incivility in Nursing Education). American Association of Colleges of Nursing National Baccalaureate Education Conference, Baltimore, MD, 11/20 - 11/22/14 (Poster presentation Team-based Learning in Online Nursing Education:  An Innovation in Curriculum Development). Eastern Nursing Research Society 23rd Annual Scientific Sessions: Informing Health Policy through Nursing Science, Philadelphia, PA, 3/23/11-3/25/11 (Poster presentation, Motivation for Entry, Occupational Commitment and an Intent to Remain:  A Survey Regarding Registered Nurse Retention). NY League of Nursing Fall In! Innovations, Inclusions & Integration Conference, Farmingdale, NY, 11/10 - 10/11/17 (Poster presentation, Working Together: Interprofessional Conversations on Cultural Diversity, Patient Safety, and Quality Care). 7th Annual Teaching & Learning Colloquium, Stony Brook University, Stony Brook, NY, 4/15 (Podium presentation, Team-based Learning in Online Nursing Education:  An Innovation in Curriculum Development). Faculty Development Workshop, Stony Brook University, School of Nursing, 2/12 (Podium presentation, The Perils of Publication). Nursing Research Day, Stony Brook University, School of Nursing, 3/10, (Podium, Motivation for Entry, Occupational Commitment and an Intent to Remain:  A Survey Regarding Registered Nurse Retention). Doctoral Forum and Lecture on Research and Evidence Based Practice, 3/12/11, Molloy College (Poster presentation, Motivation for Entry, Occupational Commitment and an Intent to Remain:  A Survey Regarding Registered Nurse Retention). Research and Evidence-Based Practice Symposium, 12/4 - 12/5/09, School of Nursing, University of Vermont, Burlington (Poster presentation, Motivation for Entry, Occupational Commitment and an Intent to Remain:  A Survey Regarding Registered Nurse Retention).